Drywood termites are slightly larger than the subterranean termites, and although they are not as common, they definitely do more damage when left untreated. These are the pests that result in expensive treatments and whole houses being tented, because they actually build their colonies within the very wood structure they inhabit. Termite prevention with a granule termiticide often costs as little as $20 per year for a 2,000 square-foot home! This odorless concentrate acts like a bait: the termite picks up the chemical, does not realize he has picked it up, takes it back to the termite colony, and ultimately destroys the colony. The process is easy, and the products are safe around pets and children, do not injure the ground water table, and are virtually odorless. Best of all, they last up to nine years. The desert subterranean termite thrives in high-temperature, low-humidity climates, so the arid Sonoran Desert is perfectly suited to them. These common termites live in underground colonies where moisture is prevalent and number up to 300,000, but they also live in desert plants like dead cactus. They build distinctive mud tubes to gain access to food sources and to protect themselves from open air. Although termites like water, the desert subterranean termite is less dependent on moisture and decay than other subterranean termites. Termite colonies are organized into castes depending on tasks: workers, soldiers and reproductives. Cream-colored worker subterranean termites are 1/8 to 3/8 of an inch in length. Soldier subterranean termites are of a similar body length, but are distinguished by their powerful mandibles. Solider termites have cream-colored bodies and brown heads. Reproductive subterranean termites are approximately one inch long. 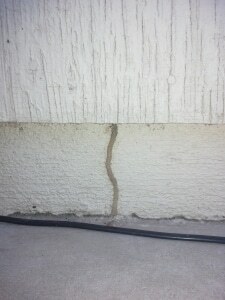 Mud tunnels on your house probably mean you have termites, but if you’re not sure whether you actually have termite activity, bring in a picture of what you see to any one of our five Valley wide stores, and we will show you how to get rid of termites in Arizona! In general, the larger the mud tunnel, the greater the termite activity. For example, a mud tunnel measuring about a nickel in width suggests many months or even a few years of activity. So, the earlier you observe their damage, the sooner you can prevent their spreading further. Another sign of subterranean termites is evidence of these tunnels on cardboard boxes, often in the garage. Many people who moved to Arizona from other parts of the country use their garage to store boxes, and termites also like boxes. Especially if those boxes are seldom moved or disturbed, the termites can quickly and quietly infest a home through the cardboard boxes.